Cleaning Your Work Uniforms | Ace Uniform Services, Inc. Cleaning your uniforms is easy and will keep you looking fresh and ready for the working day. 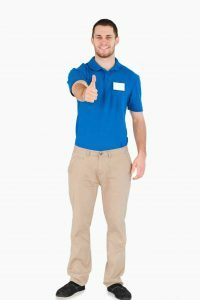 One of the negatives with purchasing uniforms for your employees, as opposed to renting, is that they will be responsible for keeping them clean instead of the uniform service providing them. You might decide to take care of the cleaning and upkeep in-house, but most smaller businesses won’t have that luxury. If your employees have the task of cleaning their own work uniforms they’ll need some tips they can use. Today we’re going to take a look at how one can go about cleaning their uniforms for work so they can keep them looking fresh. After all, a clean uniform reflects well on both your company and the employee. If a uniform is stained, one of the first steps for cleaning it comes before throwing it in the washer. Put stain remover on stains as soon as they appear as possible. This will stop stains from setting on the uniform. Often this is impossible due to the nature of some jobs, so if you have to wait until you get home use stain remover as soon as you get home in the evening. After stain removal, the next step in cleaning your uniforms is washing them. Separate your dirty clothes into whites and darks and wash them separately so that the colors don’t run together. Use mild detergent and a half cup of vinegar in the washing machine with the clothes. Vinegar softens fabric and removes odor from your uniforms. Run your uniforms through the wash cycle with warm or hot water – this will remove any bacteria from them. Once the wash cycle is complete, move your uniforms from the washer to the dryer. Always use the “tumble dry” setting to help remove any remaining bacteria. Once dry, remove your uniforms from the dryer and flatten on an ironing board. Use an iron to smooth out and remove any wrinkles from your uniform, setting the iron to a temperature appropriate for the type of fabric. To avoid wrinkling, always hang your uniforms, and use a lint remover if necessary before you set out for work. There you have it! Your uniforms are now clean and you’re ready to tackle the working day yet again! This entry was posted on Wednesday, October 26th, 2016	at 2:33 pm	. You can follow any responses to this entry through the RSS 2.0	feed. Both comments and pings are currently closed.